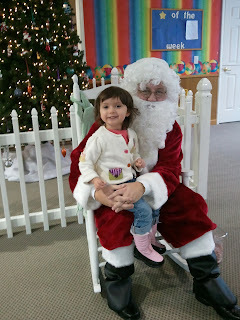 Ava told us she asked Santa for Baby Dolls and Princesses. Engrossed with her new Leap Pad on the long drive. We spent a long weekend at the Lake visiting Aaron's parents and siblings over Christmas. 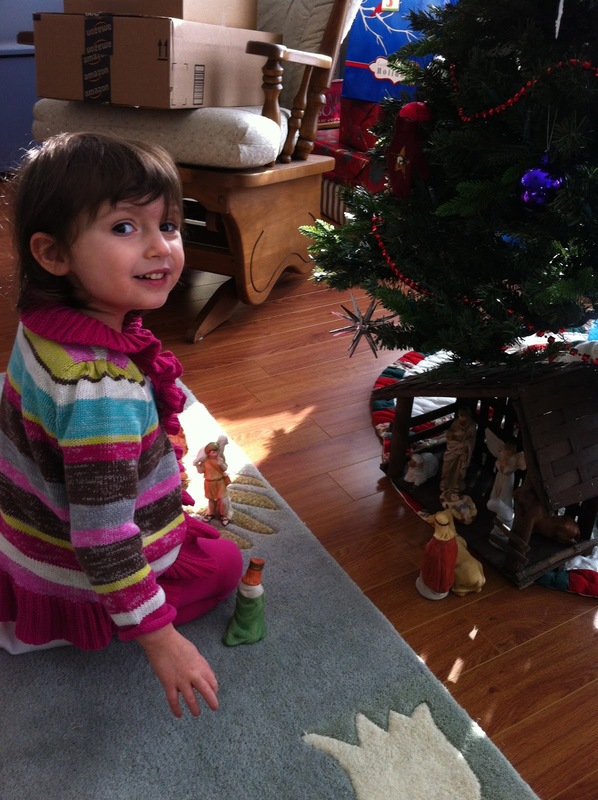 We were excited for Christmas because of the break from work and time with family and friends. Aaron's sister, Jessica, and her husband, Nick, were in town from Portland and we spent time with my other sister-in-law Megan and her family from Chicago. 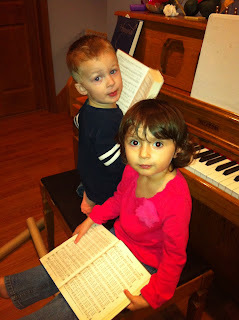 Ava and her cousin, Colin, have so much fun together! 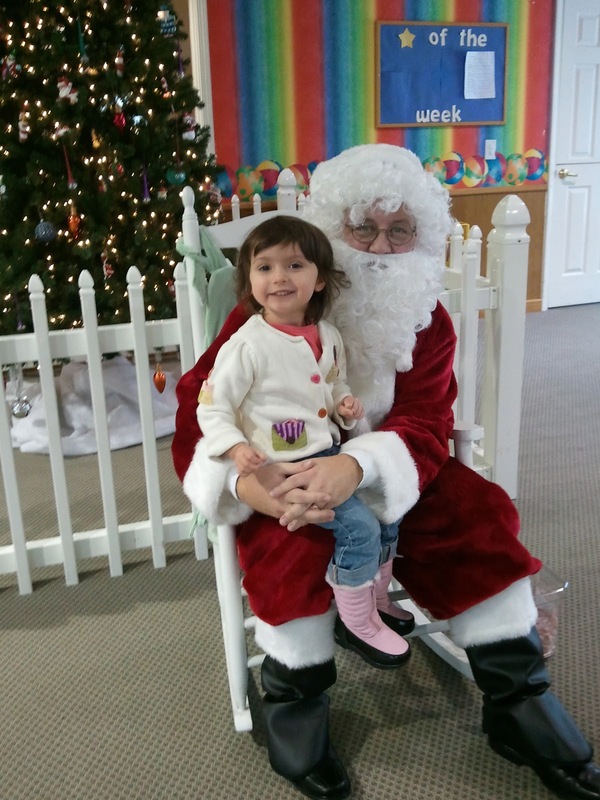 I wish I had snapped a picture of my 10-month old niece, Grace, who was having fun keeping up with the preschoolers. It was stressful finishing all the shopping, Christmas cards, and packing for the trip! I had Friday off from work to get everything done while Aaron worked late to finish up his work for quarter. We exchanged a couple presents on Friday night after he got home. Ava opened up a present from us, which was peel-able Velcro play food for her kitchen. 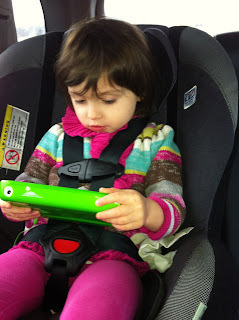 She also opened up the gift from Grandma Anna and Bernard, which was a Leap Pad! She was so excited to have her own "pad." After she went to sleep, I configured it on the computer to get it ready for the drive up to the Lake. As soon as we arrived on Saturday morning to the Lake, she looked around the house pointing out the Christmas decorations that Grandma and Paga put up since our Thanksgiving visit. She loved the nativity scene. Soon enough the house filled up with family. Ava was so happy to see Colin and Gracie! I made turkey and bean chili for dinner, then finally Jess and Nick showed up after a nightmare travel experience from the West Coast. Nick's luggage was stuck at O'Hare and he didn't get it until late Sunday night. She went right for the nativity scene. 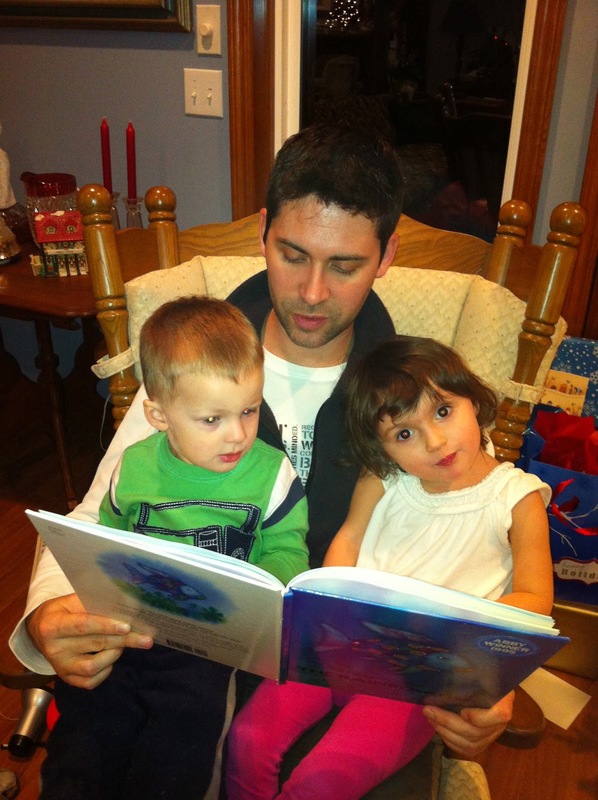 Story time with her Daddy and cousin, Colin. Playing with her new princess castle! On Sunday, we relaxed and had a big dinner with Colin's Gingerich grandparents, Grandma Berkey, Aaron's Berkey aunt and uncle and cousin, and his best friend, Zac and his family. Todd and Megan made beef sliders and garlic mashed potatoes for dinner. It was delicious! 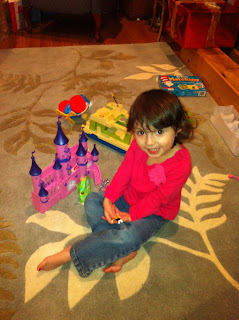 Zac's son, Colt, gave Ava her Christmas present - a princess castle. She loves it! It has a princess and a "daddy" in the set too. Ava gave Colt his Christmas gift and we got lucky because he loves match games. On Christmas Eve morning, we opened all our presents from under the tree. Grandma and Papa Berkey got Ava a pink tricycle, more play food, a kitty music keyboard and more princess things! She got a special delivery from Santa filled with princess dress-up stuff, a baby doll diaper bag, and a set of princess balls. We ate a lasagna dinner and then headed out for Christmas Eve service at church. Ava loved the music! Grandma took her to the front row and she really enjoyed listening to the music. After church, we got home around 9pm. I was thankful that Ava had an extra long and later afternoon nap. She had plenty of energy for the Bollinger-Berkey Christmas Eve get together after church. We gathered at the Lake and had a great time. After the kids went to bed, we played a game and stayed up way too late! Since Megan and Todd had to leave on Christmas morning to his parents house, we did all of our celebrations on Christmas Eve. So we slept in a bit and relaxed all morning with Nick and Jess. We drove home and arrived late afternoon. We had such an awesome Christmas! I hope you did too!